Poison Ivy can be a climbing or trailing vine, a shrub or even a small tree. The leaf edges can be smooth, toothed or deeply notched. New leaves are red in spring and dying leaves are yellow. Fall leaves are yellow, orange and red. The plant produces small, greenish-white clusters of flowers in spring and white, waxy, berry-like fruits in fall. It grows almost everywhere in Texas except for the western Panhandle and in almost any type of environment. Several variations of the old adage 'Leaves of three, beware of thee' proclaim the warning- typical 3-leaf (occasionally 5-leaf) clusters on a single stem identify it. 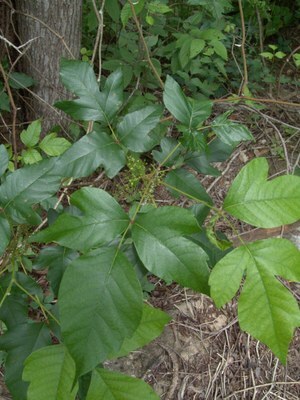 The symptoms of Poison Ivy contact begin to appear between 12 and 36 hours after exposure. They include itchy, burning rash followed by small blisters and in severe cases, large blisters and swelling. All parts of the plant are toxic in all seasons. Burning leaves of Poison Ivy are particularly dangerous because the toxin is carried in the smoke and can cause serious respiratory damage if inhaled. The best defense against Poison Ivy is learning to identify the plant and wearing protective clothing. After contact, carefully removing and washing clothing is extremely important because the resin can remain on the garments indefinitely and infect whoever handles them again. If bare skin has been exposed to Poison Ivy, immediately wash the affected area with soap and large amounts of water. This can reduce or eliminate the possible affects. If you were not so lucky as to realize beforehand that you were affected, treatment includes keeping the area clean and dry and the topical applications of hydrocortisone creams and lotions. Staying cool can help the itching. If you experience more than a mild outbreak, it is advised that you seek medical attention, since there are stronger products available by prescription. Poison Sumac reacts very much like Poison Ivy, but it looks very different. It is also usually only found in very wet, wooded regions of Texas, typically in the east. It can be a tall shrub or small tree. The leaves are arranged in pairs of 3 to 6 with a single leaf at the terminal end of the stem. The fruits of the Poison Sumac are a whitish green hanging fruit. There are non-poisonous varieties of Sumac, which appear similar, yet their fruits are red and upright. The same procedures should be followed as for Poison Ivy exposure. (Conium maculatum) See Information about this plant in the Poison Hemlock page on the Texas Invasives Website. William & Wilma Follette @ USDA-NRCS PLANTS Database / USDA NRCS. 1992. Western wetland flora: Field office guide to plant species. West Region, Sacramento, CA.